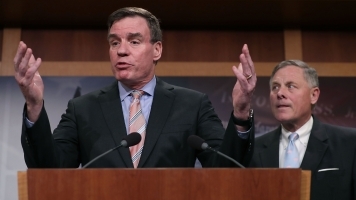 The Senate committee tasked with investigating Russian interference in the 2016 election wants documents from the former Trump adviser. Fired national security adviser Gen. Michael Flynn wouldn't hand over documents requested by a Senate committee for its investigation into Russian meddling in the U.S election. So now that committee is forcing Flynn to hand them over. The leaders of the Senate Select Committee on Intelligence announced Wednesday they had subpoenaed Flynn, who served as a top adviser to Trump during the campaign. The scope of the committee's investigation includes looking into whether any members of the 2016 presidential campaigns had ties to Russia. President Trump fired Flynn in February after he misled Vice President Mike Pence about his discussion with the Russian ambassador to the U.S. during the transition. Flynn's foreign business dealings, especially a paid speech he gave for a Russian government-owned TV station in 2015, have come under scrutiny. The chairman of the House Oversight Committee said last month it didn't appear Flynn sought or received permission to give that speech. He also said Flynn didn't disclose the payment one month later when he tried to get his security clearance renewed. "As a former military officer, you simply cannot take money from Russia, Turkey or anybody else. And it appears as if he did take that money. It was inappropriate and there are repercussions for that violation of law," Rep. Jason Chaffetz said on April 25. Flynn's attorney said Flynn "briefed the Defense Intelligence Agency ... extensively" about his visit "before and after the trip." On Monday, former acting Attorney General Sally Yates told a Senate Judiciary subcommittee that she warned the White House counsel that Flynn could be blackmailed by Russia. "The first thing we did was to explain to Mr. McGahn that the underlying conduct that Gen. Flynn has engaged in was problematic in and of itself," Yates said.